Gadacz, René R.. "Calumet". The Canadian Encyclopedia, 10 April 2019, Historica Canada. https://www.thecanadianencyclopedia.ca/en/article/calumet. Accessed 20 April 2019. Calumet, from the Norman-French term for pipe or pipestem in early North American historical records, was a potent item of ritual magic in a Plains medicine bundle and an object of religious symbolism. The calumet was also the focus of tribal solidarity and power. This sacred medicine pipe stem is covered with the skin of an eagle. 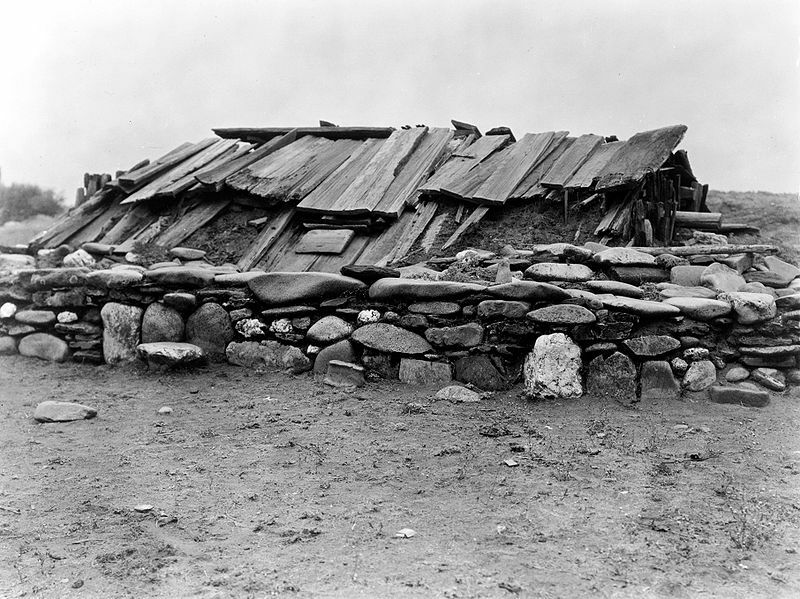 It was acquired in 1846 by Paul Kane from Cree Chief, The Man Who Gives the War Whoop, at Fort Pitt. Iroquoian decorated clay pipe found at the Dawson site in Montréal. 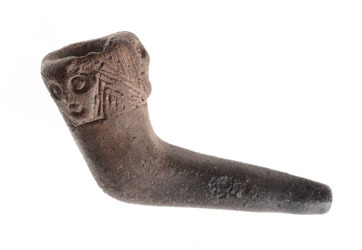 The pipe has been carbon dated to 1475-1525 AD (courtesy McCord Museum, M4243). 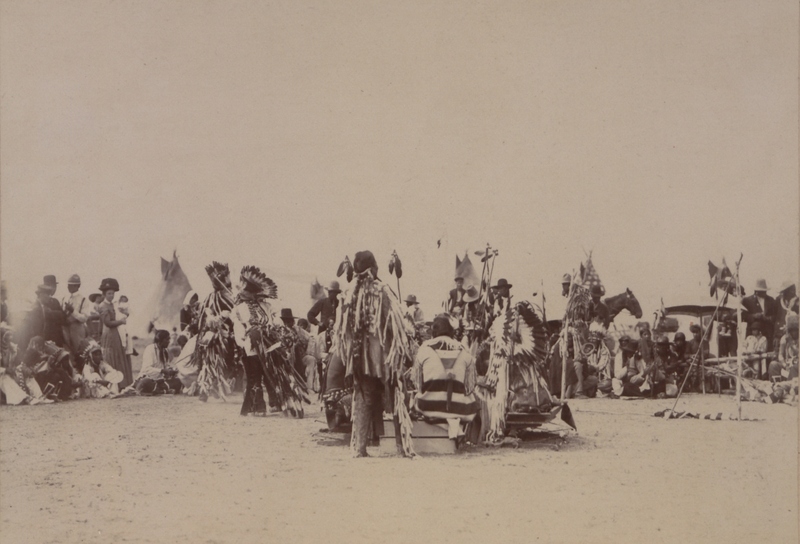 Pipe Ceremony at Waterhen River, Northern Saskatchewan (date unknown). Calumet, from the Norman-French term for pipe or pipestem in early North American historical records, was a potent item of ritual magic in a Plains medicine bundle and an object of religious symbolism. The calumet was also the focus of tribal solidarity and power. Present among many Eastern Woodland groups, the pipe was used to burn tobacco as an offering to the Almighty. Associated with thunder and signifying honour and the sacredness of all life, the calumet was used to ratify alliances, to bring needed rain and to attest contracts and treaties (see Indigenous Peoples: Religion and Spirituality). 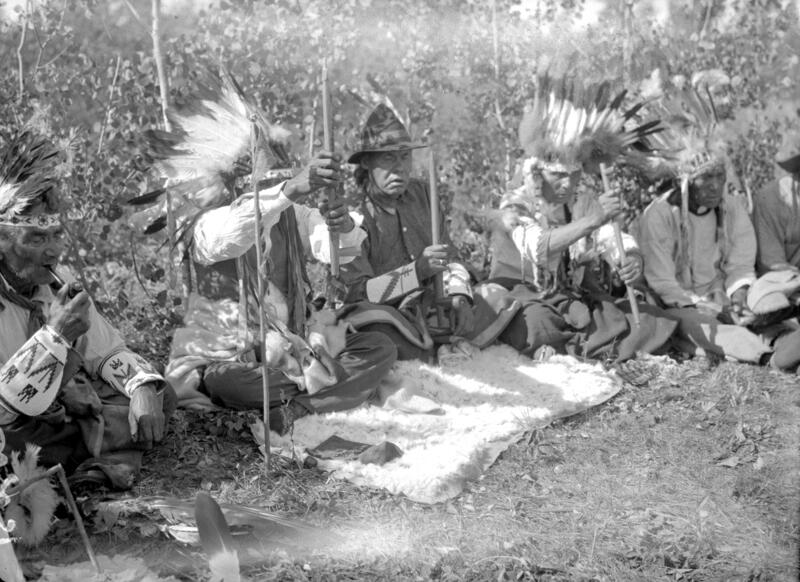 Smoking the peace pipe, accompanied by prayer, is still the traditional way of marking the beginning of talks between groups or nations and of sealing friendships. With the exception of northern and northwestern North America where tobacco and smoking were introduced by European traders, pipe smoking itself was central to the religious thought and behaviour of most native North Americans. 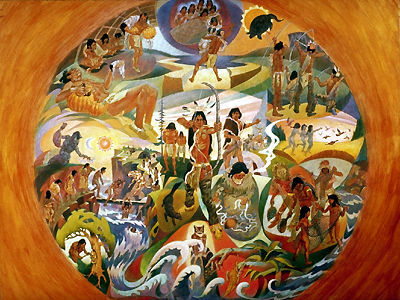 The pipe ceremony common among the Plains Indigenous people entailed offering the pipe to the four cardinal directions representing the elements of Indigenous spiritual life. There were calumets for commerce and trade, and they were smoked as both peace and war pipes. Descriptions of the calumet usually refer to the entire pipe, including bowl and stem, and not merely the stem. 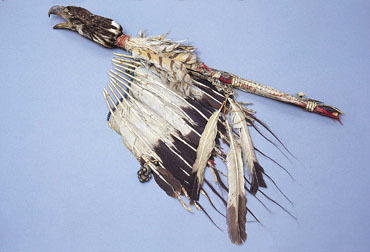 Shafts are often long, made of light wood, painted in different colours and adorned with quills, beads, fur and feathers. Pipe bowls are typically carved from stone or catlinite, a red clay, and were engraved with geometric designs, adorned with bone and stone inlay or were simply polished.